The snowfall prompted closings of local schools and clubs, and more than a dozen vehicle accidents and rollovers. A late winter storm dropped around a foot of snow and heavy freezing rain in the central Maine area by Thursday morning, causing dozens of cancellations, several accidents and power outages to thousands of Mainers. Snow started to fall in Waterville around 11 a.m. Wednesday and picked up in intensity in the early afternoon. Precipitation was expected to ease up early Thursday afternoon, according to Nikki Becker, a meteorologist for the National Weather Service in Gray. By Thursday morning, the snow had slowed down but wind gusts made visibility difficult. About 8.5 inches of snow had fallen in Mt. Vernon, the only central Maine region to report a total to the National Weather Service early Thursday morning, according to Becker. Areas north of Waterville and Augusta received closer to a foot of snow and ice, while Sugarloaf Resort in Carrabassett Valley reported more than a foot of fresh snow Thursday morning. Central Maine Power Co. reported about 4,100 outages, mostly in Oxford and Somerset counties, while Emera Maine, formally Bangor Hydro Electric, reported about 6,700 outages. 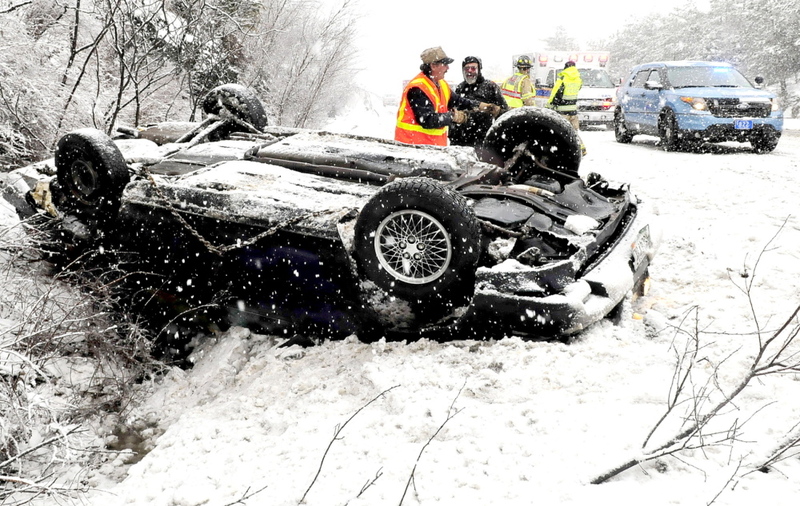 Nearly two dozen vehicle accidents were reported in police activity logs in Waterville and Somerset County during the snow storm, but none was believed to involve serious injury. After several early closings and early releases on Wednesday, many central Maine area schools and municipal offices were closed Thursday due to the storm, including Augusta- and Waterville-based schools, Augusta District Court, Kennebec Superior Court, Skowhegan District Court and Skowhegan Superior Court. Maine State Offices opened at 10 a.m., as did the Maine State Legislature, however public hearings and work sessions were canceled. Fairfield’s Town Council meeting, which was scheduled for Wednesday night, was rescheduled for March 18 at 6:30 p.m.
Not including the latest storm, about 64 inches of snow has fallen in the Waterville area this winter, according to the National Weather Service. That compares to 76 inches last year, when about 14 inches fell in March. The storm should dissipate by early Thursday afternoon before a sunny Friday with highs in the 30s. Temperatures Saturday are expected to increase into the high 30s or low 40s. A chance of more snow is possible Saturday night.